The Government has confirmed it is banning the use of all combustible cladding on new residential buildings over 18m. New building regulations will be introduced for external wall systems banning plastics, wood and other products that include combustible materials found in some aluminium composite panel systems. Materials that would be allowed are those classed as A1 or A2 under the European Classification system. Hotels and office building would be exempt because they have different evacuation strategies and the risks are lower. Full details of the proposed ban have yet to be released. It is still not known whether the ban would apply to any material in wall construction from the internal face of the wall through to its external face, as first proposed. If this proved the case internal wallpaper and paint, window frames, gaskets and seals, vapour membranes, surface finishes and laminated glass would likely be exempted. To comply with the stricter requirements, it is estimated that for a 15-storey new build requiring 1,700m2 of cladding, a wall system which comprises only materials of A2 will cost an extra £25,000-£75,000. Across England, this would equate to an expected overall annual cost of £7.5m-£11m assuming average build rates, according to the Government. The Communities Secretary James Brokenshire confirmed the decision at the Conservative Party Conference. “I can confirm that I will change the building regulations to ban the use of combustible materials for all new high rise residential buildings, hospitals, registered care homes and student accommodation. The new ban will be implemented through changes to building regulations to be brought forward in late autumn. The plan to tighten up on materials use on building exteriors came as the Government also issued a further warning that even small amounts of combustible ACM cladding fitted to existing buildings must be removed. Fresh guidance from the Government’s expert panel revealed that some experts were mistakenly advising building owners that combustible ACM cladding could remain on high rise buildings when fitted to small parts or strips of the building envelope. 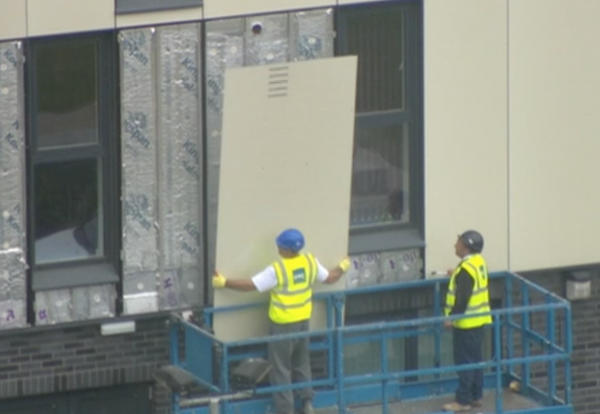 The guidance says: “We have become aware that some building owners have received advice that indicates that it is acceptable to leave small or partial amounts of ACM cladding on their buildings. “Given the risk of fire spread posed by ACM cladding systems, the independent expert advisory panel’s view is that leaving any amount of ACM cladding on a building would continue to pose a hazard to both residents and firefighters in the event of a fire.